GrandMaster II is an easy-to-use software solution that is perfect for companies in Canada who need to process simple to medium-complex payrolls. As the number one choice for thousands of businesses since 1985, GrandMaster II offers Payroll, Job Costing, Electronic Fund Transfers and Bank Reconciliation modules. GrandMaster II can help simplify your payroll process and provide an economic alternative to payroll outsourcing. This amazing software solution allows you to set up an unlimited number of payrolls - this means you can include your local staff as well as employees and staff from branches all across the country. GrandMaster II is suitable for organizations of any size and number of employees. The Job Costing module provides a comprehensive facility for recording employee work time. It allows you to assign labour burden amounts or percentage rates to particular jobs or tasks. Break down a particular job by phase and sub-phase and assign each its own burden and rate. You may also apply a particular job assignments that will distribute costs associated to the employee’s time based on the burden amount, percentage rate or actual amounts. Extensive reporting is available to track costs by job and/or by employee and to provide management summaries on the status of jobs, with comparisons to budgets or estimates. The Electronic Fund Transfers module (EFT) allows you to electronically transfer net payroll amounts directly into an individual employee's bank account, rather than issuing a cheque. The EFT system is flexible and can be setup to work with any banking format. The Bank Reconciliation module allows you to accumulate the cheques that have been issued for a number of payrolls into a common database. 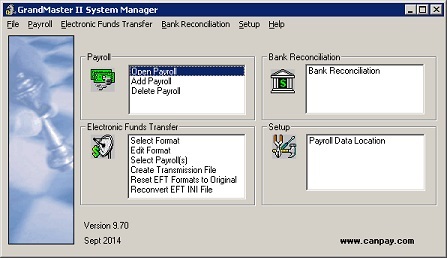 You can define up to nine different bank reconciliation databases to facilitate different bank accounts. The cheques that have been returned from the bank can then be entered into this file. Reports can be produced for issued and/or outstanding cheques, to facilitate a bank reconciliation. User Friendly - It's easy to learn. In just a few hours you will become comfortable with the program and ready to set up an typical payroll. If you need assistance, a Toll-Free support line will quickly help you progress through the most complex payroll situations. Interface With Other Systems - Import/Export function allow you to easily interface your payroll to and from spreadsheets, electronic time clocks, human resource systems and other accounting systems. Table Driven Earnings and Deductions - GrandMaster II provides a table-based feature, useful for such tasks as union-based pay scales or deductions where changes can be made in one easy entry. Report Writer - The built-in report writer allows you to custom design your own payroll reports on a one-time or regular basis. Generate quick and accurate reports by selecting information from the system, including personnel data, earnings, deductions, benefits and more. Accumulates vacation pay, statutory holiday pay, sick time, banked time, seniority, etc. How Do I Purchase GrandMaster II? Click Here for pricing details or call 1-800-665-5129 to purchase today!